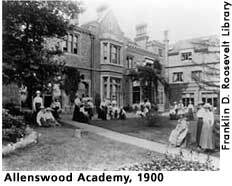 In the three years she spent at Allenswood (1899-1902), ER discovered success and a new sense of confidence and pride in herself. Although preferring to stay for a fourth year and begin teaching at Allenswood, ER reluctantly returned home at the request of her grandmother in order to make her debut in New York society. The return home, however, did not include any more education, which led to one of ER's greatest regrets of never getting a college education. Blanche Wiesen Cook, Eleanor Roosevelt: Volume One 1884-1933 (New York: Viking Press, 1992), 104. Beasley, Maurine H., Holly C. Shulman, and Henry R. Beasley, eds. The Eleanor Roosevelt Encyclopedia. Westport, CT: Greenwood Press, 2001, 488-490. Cook, Blanche Wiesen. Eleanor Roosevelt: Volume One 1884-1933. New York: Viking Press, 1992, 100-124.